One of the strongest chess players in history to never become world champion, Paul Keres was a wrecking ball against the best players of his day. Known as a “World Champion Killer”, Keres defeated an incredible nine (!) world champions in his lifetime. Despite missing out on his chance to play for the world championship a heartbreaking four consecutive times, Keres was one of the most talented players of his time and left a lasting legacy that is still felt in our day. 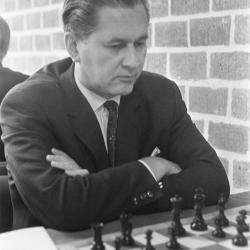 Paul Keres learned how to play chess from his father at a young age. In 1935, he became the champion of Estonia for the first time. His continued successes gained him attention from some of the best players at his time. Keres was invited to a strong tournament in 1937 where he faced off against players such as José Capablanca and Samuel Reshevsky. He won this tournament and in 1938 attempted to challenge for the world championship. Unfortunately, the match negotiations didn’t work out due to World War II starting around that time. Keres later missed out on other chances to challenge for the world championship and never got an opportunity. He was awarded the title of Grandmaster in 1950, one of the first players to be awarded the title. Later, Keres’ health got worse and he died of a heart attack on June 5, 1975 at the age of 59.